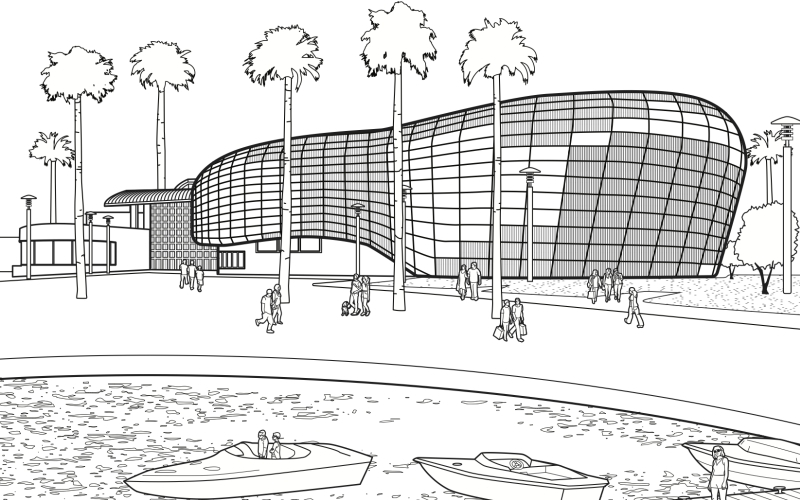 When the Aquarium of the Pacific opened in Long Beach nearly 20 summers ago, the city was bruised from the loss of a naval base, manufacturing jobs at McDonnell Douglas, and what would have been a multi-billion dollar Disney theme park. Since then, Southern California’s largest aquarium and the fourth most-visited in the U.S. has drawn nearly 2 million visitors to the beach city each year. Now the facility is rounding the bend on its first major expansion, a $53 million project that entered the planning phase 13 years ago. Called Pacific Visions, the biomorphic new wing will be clad in non-reflective blue glass meant to evoke sunlight rippling through water, while the shape of the building suggests the sinuous form of a whale. When it opens next spring, you’ll find 29,000 square feet of live-animal exhibits, a marine-art gallery, and a 300-plus-seat theater that is, appropriately enough, fully immersive. Anchoring the auditorium will be one of the world’s largest indoor screens, a 180-degree projection that wraps around and below the audience. “We bring things that are inaccessible really close to you,” says architect Duncan Ballash of the firm EHDD, known for its work on the Monterey Bay Aquarium and the Exploratorium in San Francisco. “You get the experience only a diver would have.” Rumbling seats, “ocean breezes,” and the scent of salty air are meant to transport visitors into the Pacific for up-close encounters with whales and dolphins. “It’s a way of displaying the behaviors of large marine animals in their natural environment as opposed to putting them in a tank,” says Ballash. The idea is to make the educational entertaining, so Pacific Visions will also host visiting lecturers to hold forth on oceanography, climate change, and related topics. Some people might even call it a think tank.